What do graphic designers need to know about the Compassionate Eye Foundation? In November, CEF seized a plum opportunity to find out at the 2017 RGD DesignThinkers Conference in Toronto. Accepting an invite from the Association of Registered Graphic Designers, Board member Robyn Sussel and Executive Director Melody Jacobson took part in the packed two-day event and came away with high-praise, positive feedback and a lot of great ideas for CEF. DesignThinkers is Canada’s premier conference for visual communicators. For the past 18 years, the inspiring event has set out to explore, educate and drive innovation across a network of national and international creative professionals. More than 1,700 delegates attended the November event, representing a broad spectrum of business sectors that included corporate, health, education, and government, as well as students launching design careers. It was an ideal setting for face-to-face dialogue with the design community - namely the creative directors, art directors and designers whose job it is to select stock photographs for projects within agencies, design firms and other companies – and to talk about the work of CEF. Until recently, marketing and communications efforts have relied on promotion of CEF stock images through the Getty Images website. 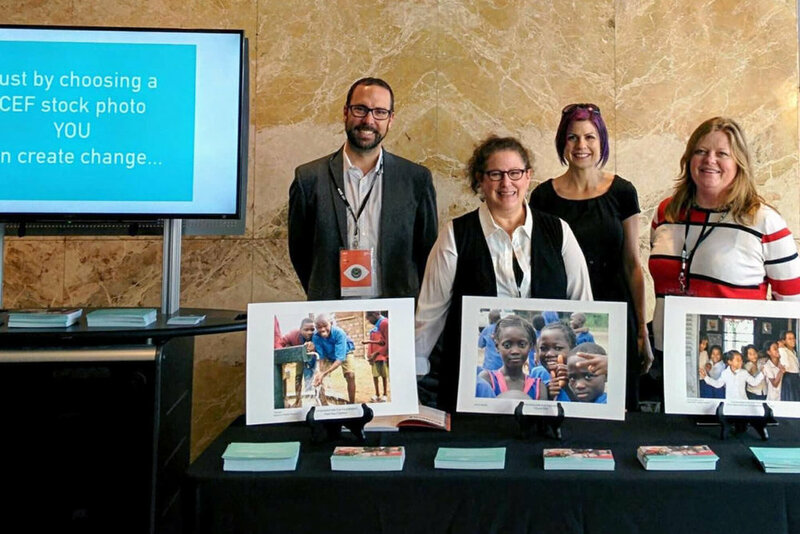 In working to establish a demand for CEF photos and build greater awareness among its end users, CEF is taking important steps on its evolutionary path as a charity. Delegates were directed to the Compassionate Eye Foundation collection on Getty Images. Most delegates were familiar with Getty, but unaware of their support for organizations like CEF. They felt that this CSR initiative reflected well on Getty. Partnership interest was also expressed from reps within the print industry. “There are some natural alignments that will help CEF grow from an organization with one partner, to an organization with many partners,” said Robyn. “The Conference was a good first step to getting people to learn about choosing CEF,” noted Melody. With a clearer understanding of what is important for creatives, CEF will refine its pitch to the design community for 2018. CEF also plans to reach out locally through the DesignThinkers Conference in Vancouver on May 29 and 30, 2018. To watch sessions from the DesignThinkers conference, visit the RGD YouTube channel.